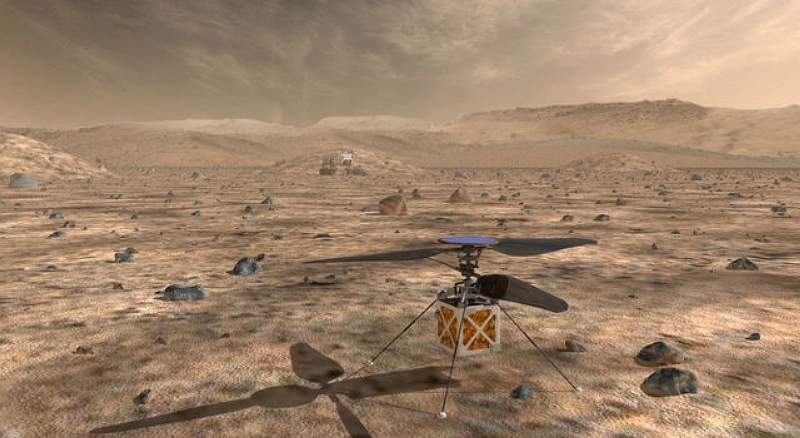 Nasa's Mars Helicopter will travel with the agency’s Mars 2020 rover to demonstrate the viability and potential of heavier-than-air vehicles. Credit: Nasa/JPL-Caltech. It includes various built-in capabilities, such as solar cells to charge its lithium-ion batteries and a heating mechanism to keep it warm during cold Martian nights. Before launching Mars Helicopter, the aircraft will be attached to the belly pan of the Mars 2020 rover, which is scheduled to be sent to the red planet by July 2020 on a United Launch Alliance (ULA) Atlas V rocket from Cape Canaveral Air Force Station in Florida, US. JPL Mars Helicopter project manager Mimi Aung said: “The altitude record for a helicopter flying here on Earth is about 40,000ft. “The atmosphere of Mars is only 1% that of Earth, so when our helicopter is on the Martian surface, it’s already at the Earth equivalent of 100,000ft up. Following its landing on Mars, the rover will find a suitable location to deploy the helicopter and drive away to a safe distance to relay commands. Mars Helicopter will perform a 30-day flight test campaign with up to five flights, each one increasing the distance up to a few 100m for as long as 90 seconds.